Georgia State men’s basketball team defeated the Louisiana Ragin’ Caguns, 86-76 on March 10 in the quarterfinal of the Sun Belt Championship Tournament. 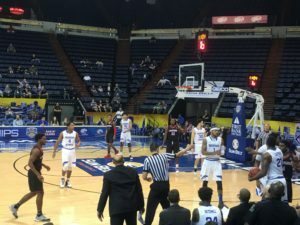 The Georgia State men’s basketball team began its postseason with an 86-76 victory over Louisiana. Senior forward Jeremy Hollowell led the effort for the Panthers, with a double-double that consisted of 16 points and 14 rebounds. “As a senior, I just want to go out and do all the little things I can do to help the team win,” Hollowell said. Freshman guard D’Marcus Simonds led the Panthers with 17 points and eight rebounds of his own in the winning effort. There were four total technical fouls during the game, which Head Coach Ron Hunter said was in large part due to the conference rivalry developed between the two teams these last few years. Georgia State will continue to move forward on the floor tomorrow at 3:00 p.m. EST to face the winner of No. 3 Georgia Southern and No. 6 Troy.